The trend of hot days followed by isolated evening thunderstorms in Tamil Nadu continues as yesterday saw another hot day across most parts of the state with 8 IMD observatories recording 100°F. Parts of Villupuram, Tiruvannamalai and Pudukottai districts recorded rains from evening convective thunderstorms. The agro weather station in Vandavasi of Tiruvannamalai district recorded about 20 mm from these convective thunderstorms. Southwest Monsoon has reached the National Capital yesterday and many parts of Northwest India. Punjab is now the only state not to see the onset of Monsoon yet with all other states of the country seeing some part of the state receiving monsoon rains. But while monsoon is nearing the completion of its onset journey of covering the country models indicate we could possibly see the first monsoon break. Ensemble Runs of models indicate most parts of the West Coast of Peninsular India expected to see below normal rains while Gangetic Plains and places in the foothills of Himalayas expected to see above normal rains for the next fortnight. 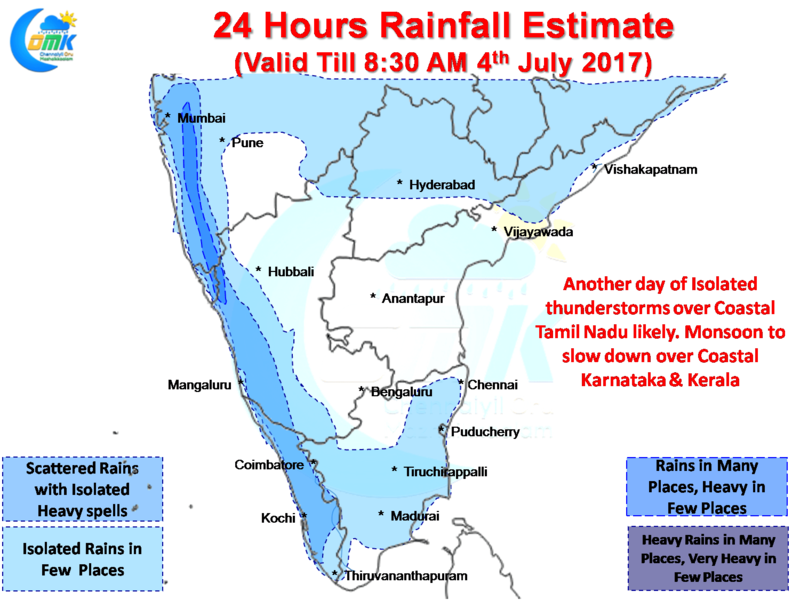 This though could give us an opportunity to see some rainfall possibilities for Tamil Nadu including Chennai. Numerical models indicate another hot day for Tamil Nadu with most places of the state expected to see 2 / 3 degrees above normal day time temperature. With Westerlies weaker than normal due to the lesser than optimum monsoon conditions prevailing over Southern parts of Peninsular India it could allow sea breeze to move in around late afternoon bringing in some respite from the heat as well as triggering possible thunderstorms. As mentioned earlier the monsoon is expected to remain weak in the southern parts of Peninsular India with Kerala & Coastal Karnataka seeing weak monsoon conditions prevail. While today also parts of Konkan region could see isolated heavy rains models indicate even Konkan will possibly see a slowdown in monsoon conditions this week as the Break scenario gets activated. Like yesterday Coastal Tamil Nadu is likely to see another day of isolated convective thunderstorms in the evening with places around Pondicherry / Delta / Pudukottai well placed for a spell or two of rains. Whether Chennai could get any benefit out of these thunderstorms will depend on how the wind pattern plays out for the day and where the initial set of thunderstorms form.